Researchers at the Toyohashi University of Technology have successfully fabricated a lithium trivanadate (LVO) cathode thick film on a garnet-type oxide solid electrolyte using the aerosol deposition method. 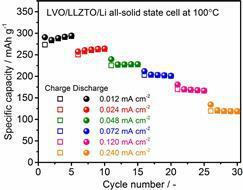 The LVO cathode thick-film fabricated on the solid electrolyte showed a large reversible charge and discharge capacity as high as 300 mAh/g and a good cycling stability at 100 ºC. This finding may contribute to the realization of highly safe and chemically stable oxide-based all-solid-state lithium batteries.